To those who read an old blog entry called "Damaged Luggage and Contents" -- you will see that one (1) piece of my suitcase and some of its contents got severely damaged on our Delta Airlines flight from Omaha to Manila. If you are curious on what took place, please read that old entry by clicking on this link. For all travelers out there, an account on how this incident was resolved might help you. I sincerely hope it never happens to any of you but in the event that it does, I hope I can point you in the right direction. Here is a copy of the e-mail that we sent to Delta Airlines the day. We are Robert and Samantha Johnson. We flew Delta with the following flight information. We are filing a Damage Claim Form based on the condition of 1 piece of luggage that we claimed as we arrived in Manila last night. It was severely damaged and many of its contents were destroyed as well. Attached are the scanned copy of the filled out forms. Here is the list of damaged property with description and cost. We hope that you find all documents and pictures sufficient to support our claim. We are in complete faith that the damages that were sustained while in your care will be properly reimbursed at the soonest possible time. Looking forward to your attention to this matter. We received a telephone call the very next day by Delta Airlines' Manila office. They confirmed that they received my e-mail and that they will forward it to Delta's Atlanta headquarters for processing. 44 days later, we finally received an e-mail from Delta Air Lines Baggage Claims. Here is what was written. Please accept our apologies for any inconvenience resulting from Delta’s recent mishandling of your baggage. We look forward to working with you to resolve this matter and you can expect to receive a substantive response from our office within a maximum of 60 days. We are working hard to improve our response time to mishandled baggage claims and apologize for the length of time it might take to settle your claim. If at all possible, please refrain from the re-submission of duplicate claim forms if we are slow in responding. On September 10th, we received another e-mail confirming that Delta will reimburse the damages. I was sorry to learn about your damaged luggage. We regret that you encountered any difficulties as we place constant emphasis on the careful handling of our passengers' property. You are entitled to reimbursement for the cost of damaged suitcase and clothing, and our check for $429.00 will be mailed under separate cover. Please accept our apologies and give us the opportunity to do a better job the next time you travel. 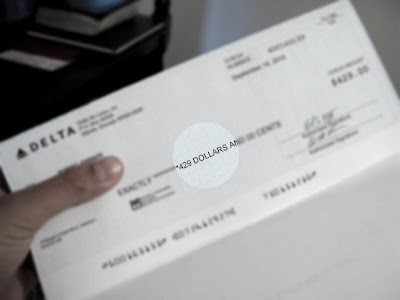 On September 18th, the check finally came in the mail. Here are a few lessons that I learned from this incident. 1) If I can afford a luggage with hard casing, I will definitely invest in it. In fact, I will start saving up for it. It is better to buy something that can withstand long, international flights we have been accustomed to taking. 2) I should always be mindful of my initial reaction when I see a damaged suitcase. This is a great opportunity to react graciously and not cause any one else to "stumble." Instead, be alert and use your camera to take photos immediately and document every detail. The pictures will speak for itself. 3) God does not get glorified when we focus on who to blame. Believe it or not, the airline did not maliciously intend to destroy my belongings. Yes, it is their responsibility to ensure my things are unharmed but accidents do happen. 4) Give the person-in-charge a chance to help. Do not take away the dignity of that person trying to assist you. Approaching that person with kindness is so much better because it blesses him/her. Who wants to serve a customer who responds in anger? 5) Patience goes a long way in waiting for that final resolution. Sure, I could have called and followed-up repeatedly during that long wait. I had every right to. I just knew that ultimately God was in-charge and the check will arrive at the most perfect time, just when we really need it. And it did! Just in time for Robert's birthday and our upcoming 2-week road trip. 6) Thank everyone who helped resolve this incident. Yes, they were doing their jobs and I am, in no way, required to thank them. But I still chose to do so. I do not like overlooking an opportunity to affirm someone on a job that was accomplished. These people probably encounter disgruntled customers all day, every day. Do not miss the chance to bless someone this way. 7) If something similar happens to you, please declare the true value of the items that were damaged. If you cannot remember how much they cost and lost the receipt, you can always look it up on the Internet and have a good idea on how much it costs. An honest declaration is simply the right thing to do. 8) Give 10% of the check away. It does something to a person's soul when he/she is in the habit on regularly giving away part of his/her income. In my case, I always part with at least 10% of whatever money comes my way. It helps build my faith and lessens any of my selfishness. For this particular check, I am giving it to the church who is nourishing me at this season of my life. Thank you for allowing me to share a bad story with a happy ending!